The North Carolina Department of Transportation wants your participation in a short survey on the potential impacts to transportation in North Carolina. Participate by June 2, 2019 to help the Department understand what is important to you and your community. 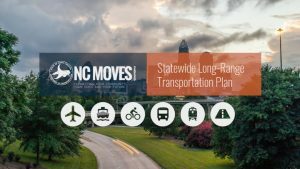 Your feedback will help guide North Carolina’s future transportation policies and investments. Thank you in advance for considering this request. If you have any questions or concerns, please email NCDOT at ncmoves@ncdot.gov. Sign up to receive information throughout the study and learn more at www.ncdot.gov/ncmoves. Persons who do not speak English or have a limited ability to read, speak or understand English may, receive interpretive services by calling 1-800-481-6494.